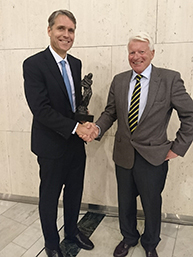 Professor Ole Andreassen receives the prize from Jan-Fredrik Wilhelmsen, chairman of the Bergesen Foundation. Photo: NORMENT. NORMENT's director Ole Andreassen has received the Honorary Award 2018 from the Bergesen Foundation for his outstanding research on psychotic disorders. Professor Andreassen receives the prize for his contribution within the field of mental disorders research, both also for his role as a director of NORMENT. Through the NORMENT centre, Andreassen has created a strong and multidisciplinary research environment, and he has succeeded in combining different scientific and methodological approaches in his research. Andreassen is also among the most publishing researchers in Norway, with a number of publications in the most prestigious journals in the field, and has an extensive collaboration with leading research environments both nationally and abroad. The Bergesen Award includes 2 million NOK to be used on further research. In addition, Andreassen receives 150.000 NOK as a personal recognition and a statuette made by the Norwegian artist Per Ung. The prize was awarded during a formal ceremony at the University of Oslo on Thursday the 4th of October.